Oh my god you guys. Christmas came early for me this time, because I recently got super spoiled by The Body Shop. They send me over a big box filled with amazing smelling products and I literally felt like I was opening my presents for Christmas already. It’s part of The Body Shop Christmas collection that’s in stores right now. Living the good life! Honestly The Body Shop is one of my favourite brands when it comes to body products. I was positively surprised when I also saw that they added some lifestyle + make-up products for me to try out. Have to say, I’m digging them! I don’t know if it’s me, but these products make me feel like Christmas! Anyways, so what did I get? First off, I got a couple of products from their new Frosted Plum collection (a candle, lip balm and bath fizzers). They have a very nice fruity and sweet scent and I think a lot of younger girls (or girls that like fruity scents in general) will adore this. 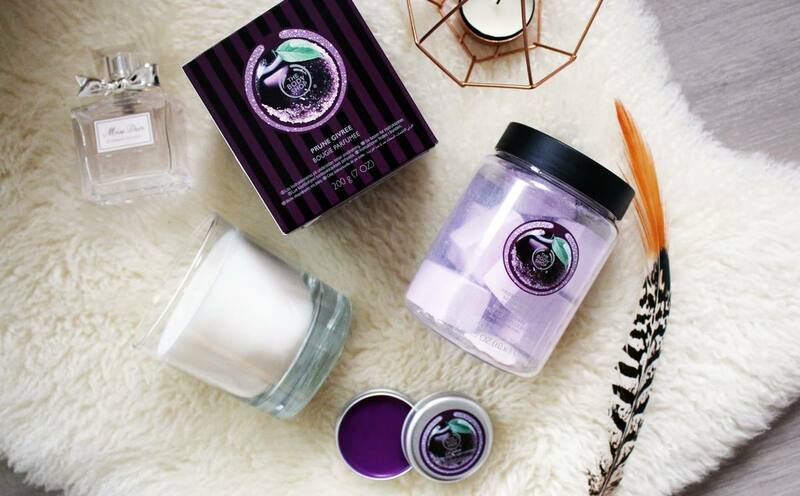 Can’t wait to take a bath with the bath fizzers and burn the matching candle too… The candle costs €15, the lipbalm is €5 and the bath fizzers cost €15. Next up is the Strawberry Festive Picks. 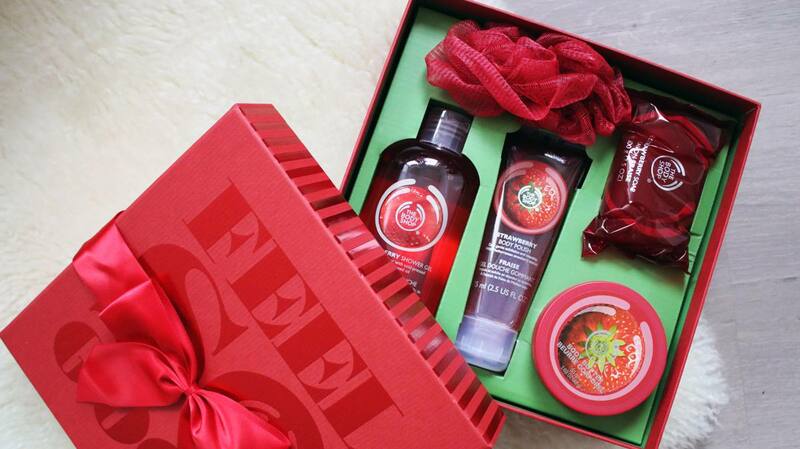 The Strawberry collection from The Body Shop isn’t a limited Christmas edition, but this set is. It comes in a cute box with a big bow on it – no need for wrapping this baby up! The set contains a Strawberry Shower Gel, Strawberry Body Butter, Strawberry Body Polish, Strawberry Soap and Red Mini Bath Lily. If you give somebody a set like this, you got her covered for a pretty long time when it comes to bath products! I also really like the scent of the Strawberry line. It’s sweet, but not too sweet, so I think a lot of people will like this scent! The set costs €25. Last, but not least is The Body Shop Christmas make-up. I didn’t really know that much about The Body Shop make-up, but I have to say, I’m pretty impressed. The nail polish is one of the best glitter nail polishes I’ve tried, because it coats your nails with a super big amount of glitters in one single coat. I feel like 2 coats would be enough to cover your nails completely with the gold glitter. I prefer using this glitter on an accent nail, so that’s why I only used one coat. The eyeshadow palette is also really nice. It has some lovely, warm colours and the pigmentation is good too! 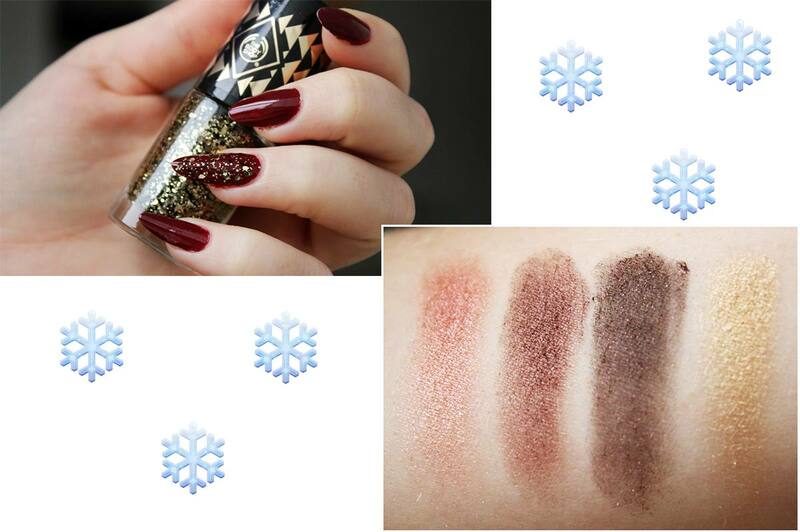 The Colour Crush Nails Gold Sequins costs €6 and the Grooving Gold Eyeshadow Palette costs €25. If you’re on the look out for some great Chrismas presents (trust me, I know it sounds so early to be Christmas already, but better safe than sorry right? ), definitely check out The Body Shop. They have so many different scents and products, I’m pretty sure that you can find the perfect gift idea for your friends and family! 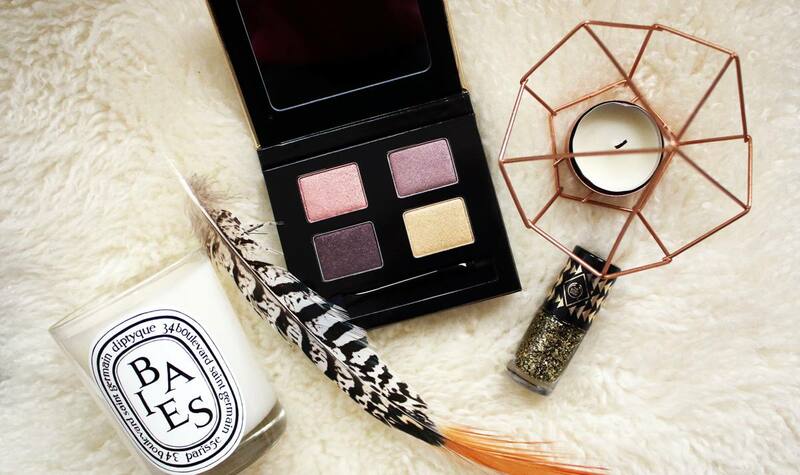 My personal favourite is definitely the candle and the nailpolish. They make me feel like Christmas is already here! So yeah, hope I inspired you with some gifting options with this blogpost! Are you already Christmas shopping? 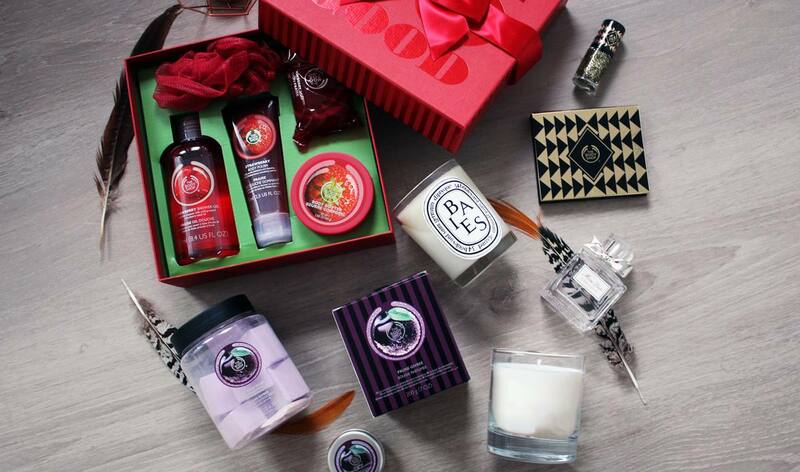 The Body Shop heeft altijd zulke leuke kerst producten! Mooie producten laat je zien! De geur lijkt me erg fijn, je nagels zijn prachtig trouwens! Esmee recently posted…Herome Nail Hardener Strong: werkt het echt? i loveeeee it! Het ziet er zoooo leuk uit! 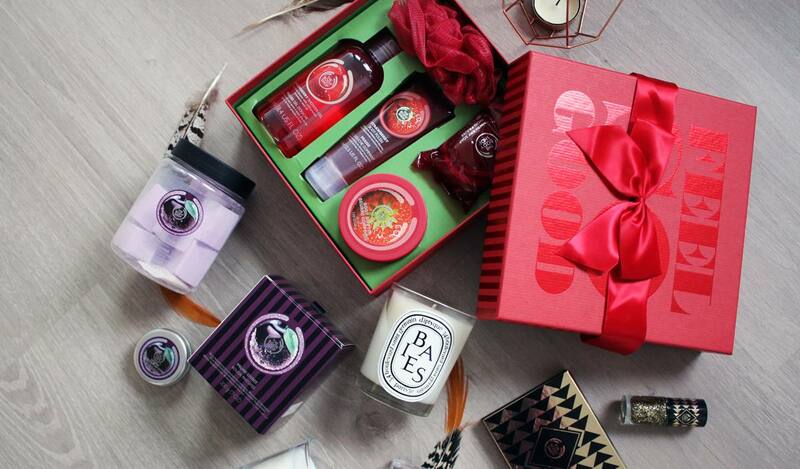 The Body Shop nailed haar kerstproducten wel altijd weer. Ziet er zo mooi uit allemaal! Fleur Sophia recently posted…WIN een winterpakket t.w.v â¬59,88! Ziet er allemaal heerlijk uit zeg! Prachtige items meid ziet er super uit! Wat heerlijk dat je dat gekregen hebt! Ik moet snel even The Body Shop in, zie heel wat leuks! Wat een fijne producten zeg! The Cristmas lines look festive as ever, but the scents are too sugary and sweet for me. Do like those polishes, have been standing with that topcoat in the store. Wauw zalig! Ik ben vooral benieuwd naar de Plum-lijn.